The Commodores Big Band is based in Victoria, BC, Canada. The band is a crowd favourite on the local scene as is reflected in numerous performances for conventions, weddings, anniversaries, fundraisers, parties and fairs at venues including Butchart Gardens, The Empress Hotel, Crystal Gardens, The Union Club, Government House, Victoria Conference Center, Victoria Golf Club and Uplands Golf Club. The Commodores Big Band has been a feature presentation at the annual Oak Bay Tea Party since 1993 and the Saanich Strawberry Festival since 1988. The band’s repertoire consists of over 1000 arrangements that include swing, Latin, rock and Dixieland. The band’s vocalist, Kim Greenwood, is accompanied by a standard big band configuration of 5 saxophones, 4 trumpets, 4 trombones and rhythm section. The Commodores Big Band members embrace a spirit of enthusiasm, drive and professionalism that has determined the band’s success, longevity and popularity with fans of all ages. Have a look at our Flickr page for historical and current photos of the band. Band by a group of musicians keen to play the big band style of music. 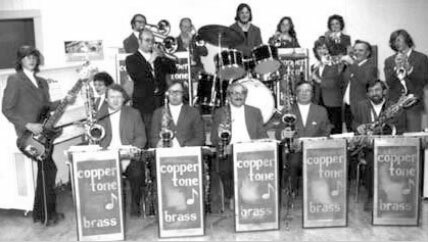 The band was originally named the “Coppertones”, a reference to its Police Band origins, and was led by Don Kerley. It soon became the Don Kerley Big Band and upon his retirement from the band in 1984, it was decided to use the name Commodores Big Band in keeping with the nautical flavor of the city of Victoria. Also in keeping with the nautical motif, a uniform of navy blue blazers, white shirts, pants and shoes. In addition to the commitment and musicianship of the members over the years, another reason the band has been a success has been the fine dedicated leaders including the late Don Kerley, John Pinchback, and Marty Vanderweerd ; and Vic Keating, Al Butler, and Bruce Ham. Vocalist Clare Wynters retired from the band in 2012. She joined the band in 1985 and was a special feature of the band for over 25 years with her lively personality and wonderful sense of big band vocalizing. media and “choice” gigs at Victoria and Vancouver Island top venues.